This is a sponsored post. All opinions are my own. Please view my disclosure. 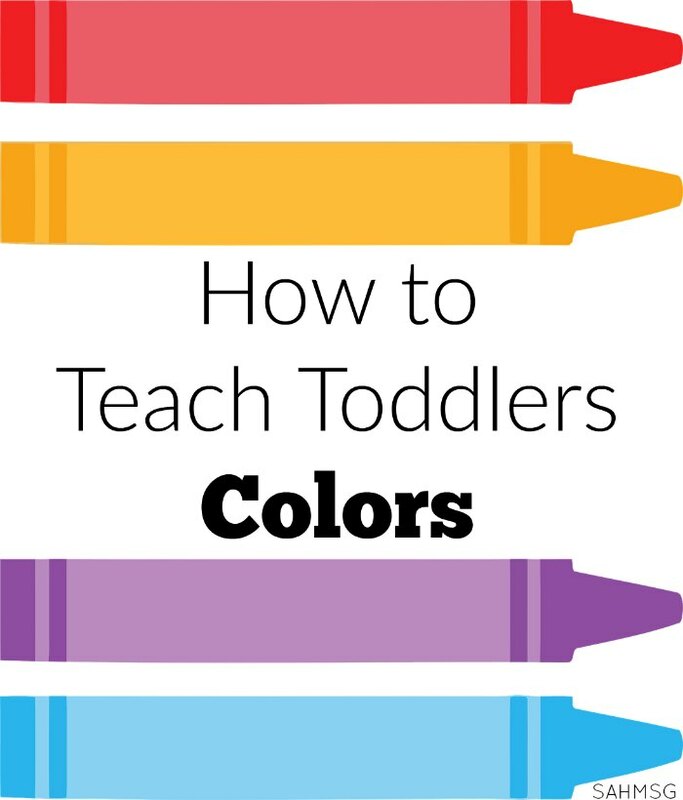 The confusion about how to teach toddlers colors is officially over! There is so much conflicting opinion about whether to teach toddlers or whether to just sit back and watch them play. My children have always behaved better when they were mentally challenged by a learning activity. When we have free play all day there is more sibling rivalry and more mess that engulfs my house. That is not a bad thing. Kids need to play and pretend. It is also great for them to be taught by you in small doses even as toddlers. 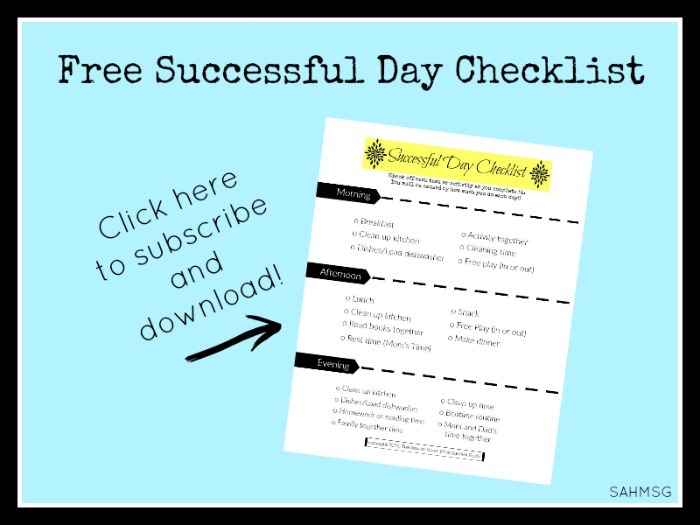 It can be helpful to incorporate lesson plans to teach your child something new every week. That helps you feel more successful as a mom and keeps the children mentally engaged at points in the day to help their behavior. A plan can help you focus. It is a place to start during activity time each day. 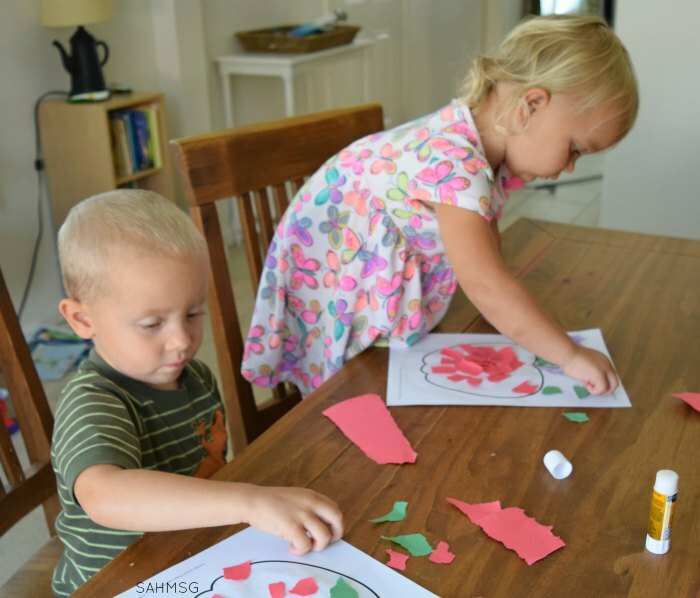 Autumn McKay, a teacher-turned stay-at-home mom put together some ideas for us to help teach toddlers colors. No crafty skills are required. I tried out some of the color lesson plans that Autumn put together to share with moms looking for toddler activities that teach colors. In a ten week guide, with one lesson per day, lesson plans for learning colors are all organized for us toddler moms! Each color is taught over the course of one week. Every day there is a simple activity to teach that color to your toddler. They are really fun for little ones. 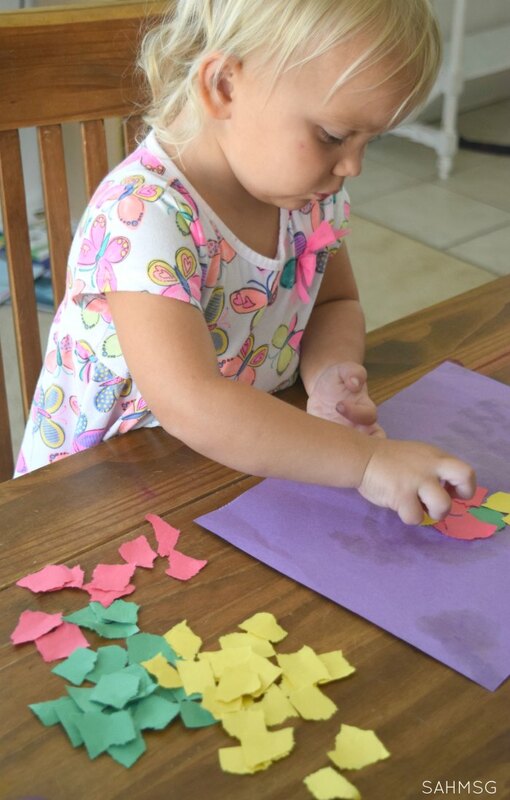 One of the red activities in Toddler Lesson Plans: Learning Colors was a gluing activity with ripped paper. Toddlers like to rip things. They are very curious about glue. 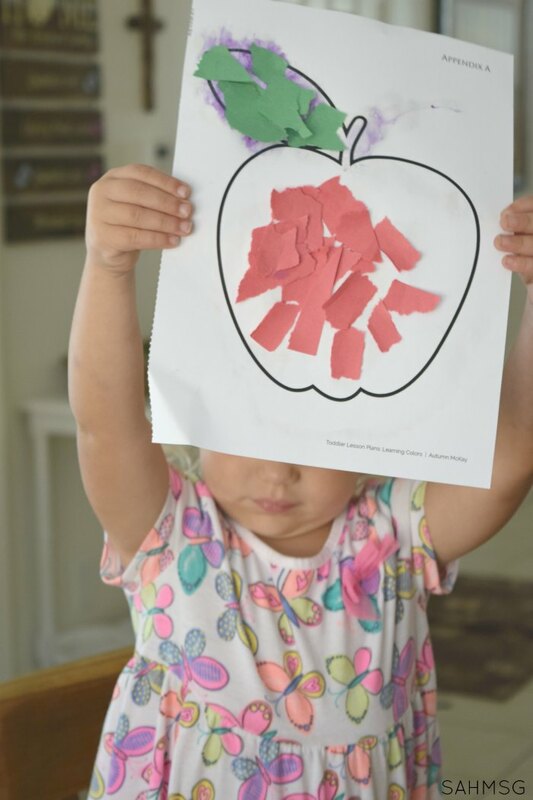 Add in the fine motor activity of gluing pieces of paper onto an apple printable and you have a great learning activity that fits the attention span of a toddler. One of the best things about Autumn’s color lesson plans book for toddlers is that all the required printouts are included in the back of the book. You can print extras for coloring sheets or other activities too! I am a big fan of activities that can be used more than once. That is why we store our learning games in bags and keep them in bins for using again and again. You can purchase Toddler Lesson Plans: Learning Colors on Amazon and get all 10 lesson plans in one place to use with your children. You do not have to do a lesson each day. Many days we do not have time for structured lessons like this. That is why this lesson plan guide is so helpful. You can pick up where you left of. If you are teaching preschool at home, this is a great teachers manual for teaching colors. The twins needed my help to add glue to the apple. 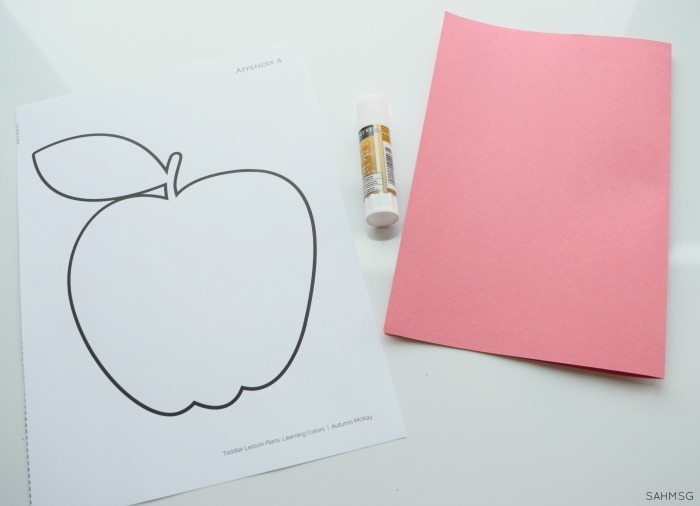 You could put the glue on the apple and then just have your toddler place the pieces of paper on the printout. The book offers tips like this so you can make the lesson work for your toddler or preschooler. Before I started doing these activities with the twins, I printed out all of the printable pages. After the twins were done with their torn paper project for the color red, they wanted to keep going. 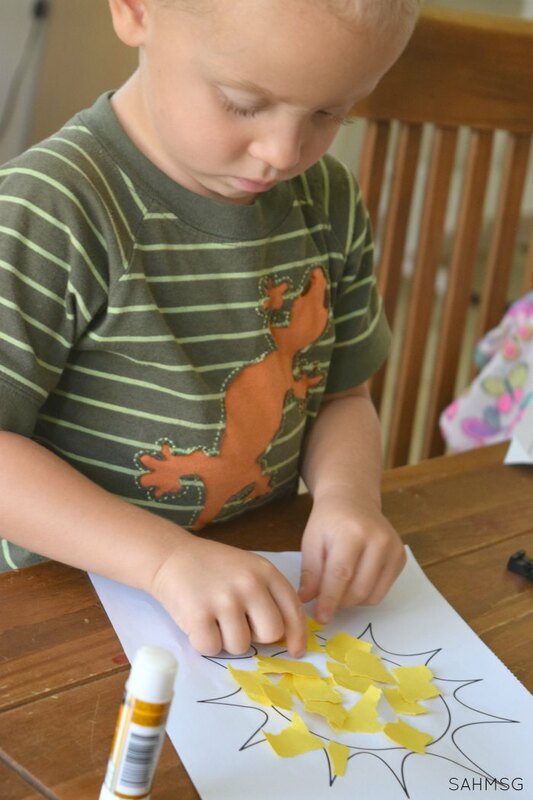 I grabbed the sun printout from Toddler Lesson Plans: Learning Colors. We continued with the torn paper, but used yellow this time. The sun printout is for another activity. I can just print out another copy since I have the book. I wanted to follow my toddlers’ interest and let them work as long as they could since we had time. It is fun to help expand a child’s attention and focus like this. They really enjoy completing projects when they are developmentally appropriate like the ones in this book. We even extended the torn paper activity and added a collage too. My daughter really enjoyed this! I am pretty excited to work through the rest of the activities Autumn included in her book. There are 10 weeks with 5 activities each. That is 50 activities to do with your toddler that teach colors! If you are someone who wants to follow a plan for teaching your child at home, this is a great resource for you! Your child will be learning so much. Toddler Lesson Plans: Learning Colors is essential for moms who want to feel organized in their approach to teach toddlers colors. You can check out Toddler Lesson Plans: Learning Colors, or buy it on Amazon. I have shared some activities that would be great for expanding on the book’s activities. 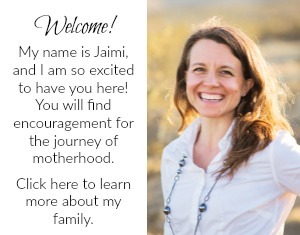 Get your copy of Autumn’s book on Amazon and check out her website with great ideas for moms, Best Mom Ideas. Both are great resources for making the most of your time with your kids. Then check out the list included below with even more toddler activities for teaching colors. Make a book of colors with this simple DIY books idea. Color this shave cream with food coloring or kool aid and it becomes a sensory learning activity. Make these milk carton blocks as a color activity. Turn this Number Path into a Color Path. 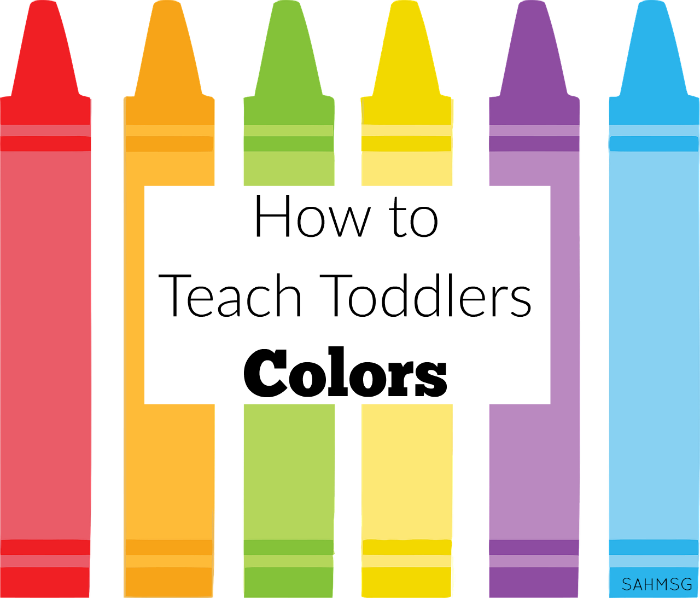 How have you approached teaching your toddler colors? Did you use lesson plans or a more free play approach? Thanks for pinning this image so other parents can use the ideas in this post too. 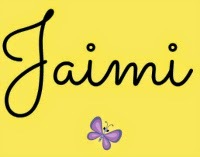 Hi Jaimie! I love your site – had a quick question about this book. Could you tell me what colors it teaches? My three year old already knows his rainbow but I’m interested in activities to expand his learning into teal/beige, etc. Thank you! Hi Danielle, The Colors Lesson Plan book covers basic rainbow colors, but the activity ideas are a great spring board for you to add in the colors your child still needs to learn. 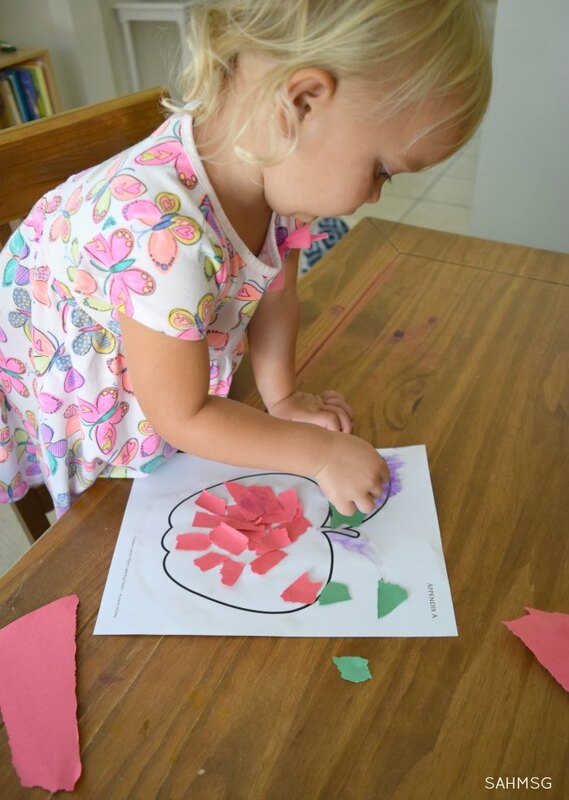 The activities in the book are so helpful and perfect for toddlers.